A green light at Mill and Main streets means nothing Thursday evening as the snowstorm that came through town gridlocked traffic for hours. Thursday’s late afternoon snowstorm brought Aspen rush-hour traffic to a standstill as it dialed up the perfect recipe for a commuter nightmare. From bus accidents in the downtown core that shut down in-town commuter routes as well as downvalley routes out of that section of town, to multi-car crashes on Red Mountain Road and Power Plant Road that closed those roads to the parking lot that Main Street became, the storm wreaked havoc, officials and commuters said. “From 3:30 to 7:30 (p.m.), there was gridlock,” said Aspen police Sgt. Terry Leitch, who helped coordinate the chaos. “It was like the Castle Creek Bridge had been taken out or something. The snow began to intensify about 3 p.m., just as Aspen’s normally heavy rush-hour traffic was cranking up, he said. Add to that equation the Christmas-related traffic in town — Christmas and the Fourth of July are the busiest weeks in Aspen — and everything — buses and cars — simply stopped in place, Leitch said. Leitch said it was the worst traffic jam he’s seen in 16 years in Aspen. The rest likely had an experience similar to that of Charlie Matthews, who works in the county courthouse on Main Street and Galena Street as records custodian for the Pitkin County Sheriff’s Office. Matthews said he left the courthouse in time to catch a 5 p.m. downvalley bus at Rubey Park. However, one block from Rubey Park, the bus in front of his bus crashed into a parked car on Durant Aveune and blocked the road. Leitch said bus and truck accidents on Durant Avenue, as well as Aspen and Monarch streets, snarled the bus routes out of Aspen downvalley, as well as in-town routes like the Hunter Creek bus. After that, buses were directed the opposite direction, where many came to a dead-stop around the Original Curve area, which does not feature a bus lane, he said. Matthews said he got off the first bus that was stuck on Durant Avenue, walked back to Rubey Park, got on another bus and sat in traffic near Original Curve until he found himself back in front of the Pitkin County Courthouse again at 7 p.m.
Fortunately, though, not long after, police organized a convoy of nine or 10 buses stuck in traffic around Original Curve and led them down the middle of Main Street until they could reach the bus lanes that begin at Second Street, Leitch said. “It started loosening up after that, about 7:30,” he said. After the convoy, Matthews said the buses were able to leave town relatively quickly, and that the route downvalley was so clear it was “eerie” as he barely saw another vehicle. He arrived home in the Willits area about 8, he said. The three-hour commute usually takes 45 minutes, Matthews said. At the height of the gridlock, it was taking drivers two hours to get from the Hotel Jerome to the Hickory House on Main Street, Leitch said, a 10-block distance. At one point, traffic was backed up from Truscott to beyond Original Curve, he said. “That’s the whole town,” Leitch said. Officers shut down Power Plant Road about 4 p.m. after two separate accidents occurred on the steep section of road that runs under the Castle Creek Bridge, Leitch said. Power Plant Road serves as a short-cut for people who cut through the West End to try to avoid Main Street. Once the shutdown occurred, those who partook of the shortcut found themselves gridlocked in the West End, just like their counterparts on Main Street. Red Mountain Road also was closed to one lane above Willoughby Way after police responded to an accident in the area reported to be one car hung up on a guardrail, Leitch said. When Leitch arrived, he found five more vehicles had crashed since the initial report, he said. Aspen police responded to a total of seven accidents — including one hit-and-run — while Pitkin County deputies responded to five accidents, he said. 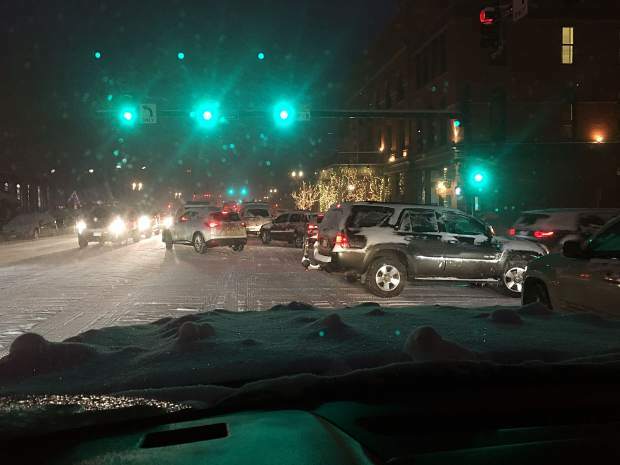 Pitkin County Undersheriff Ron Ryan said it took him an hour and 20 minutes to go nine blocks from Galena Street to Fifth Street starting at about 4:45 p.m. After that, he began helping Aspen police deal with traffic issues, he said. Still, it wasn’t the worst traffic situation Ryan — who grew in the Aspen area — said he’s ever seen. The incoming, eastbound traffic lanes were mostly clear, which meant an ambulance or other emergency vehicles could have gotten in and out, unlike some Fourth of July traffic he’s seen where both directions have been jammed. “But that’s the most time I’ve ever spent in my car on Main Street,” Ryan said.